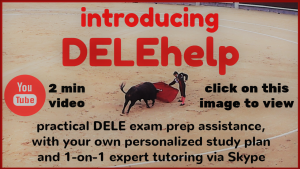 You probably have asked yourself: “How can I do well in the DELE exam written tasks? (or in the equivalent writing tests of the DELE’s online twin, the SIELE, or its American equivalent the WPT – Writing Proficiency Test). What are the do’s and don’ts”? What do I have to KNOW, and which SKILLS must I hone? 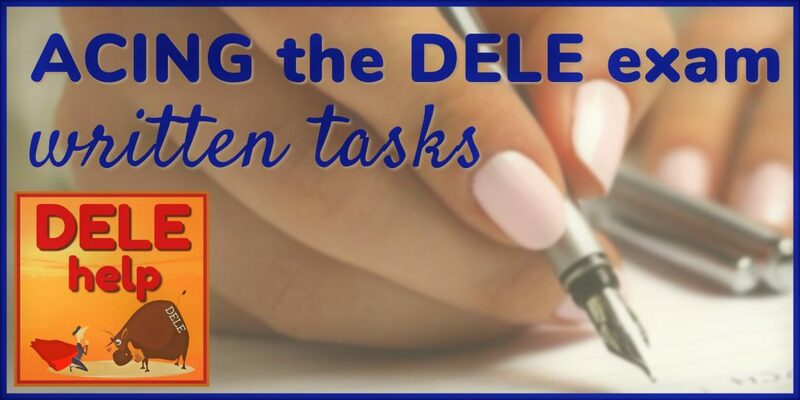 The essential requirement for acing the DELE exam’s “expression in writing” tasks, is expertly-guided preparation (with lots of practice, simulating exam formats). This preparation needs to be personalized, practical, goal-orientated – i.e., pass the exam – and focused on strengthening your individual weaknesses. So that, on exam day, you will have that calm, confident mental concentration that will allow you to almost reflexively apply the knowledge and writing skills you had practiced beforehand with our exam simulations. During your preparation you need to become totally familiar with the DELE exam’s goals, plus its format, and the practical constraints as well as the scoring criteria for this part of the DELE exam. 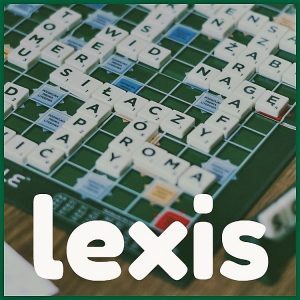 You need to practice your writing skills – for correctness, for stylistic aptness, for message coherence, and as a practical portrayal of the extent of your “linguistic scope” – this latter meaning your vocabulary and lexis. You need to practice and practice some more, getting expert guidance and feed-back, one-on-one, about where and how you need to improve. On exam day, you have to read and re-read the instructions for each task, to be certain that you understand exactly what is required. Then you have to set out to demonstrate your knowledge and skills, by firstly planning and sketching out an apt and coherent answer. 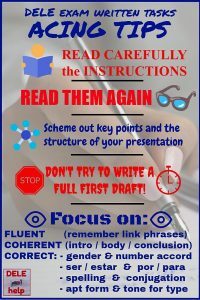 With this scheme of presentation in hand, you have to start writing down your definitive answer, because there won’t be time to try to first do a draft in rough, and then re-write it all. From this brief summary you will notice that there are elements of abstract knowledge of Spanish that will be required of you. More importantly, though, there’s the art of written presentation, which skill relates to the overall DELE goal of testing your ability to communicate effectively in writing, with tasks simulating every-day, real-world writing projects. Furthermore, there are practical issues such as handling the time constraints, as well as “finger fitness” and legibility of writing longhand (if you haven’t done it in a while). In this blog-post I will expand on all of these elements, giving you practical, battle-tested tips (having passed the DELE C2 myself). For illustration, I will focus here on actual examples taken from the mid-range B1-level (since I cannot hope to deal with all six DELE levels in detail in a single blog-post). However, the principles and the assessment criteria are essentially the same over all six levels, with only the length of the individual tasks and their time-frames changing, plus of course the extent of the linguistic scope required for each level. We will deal first with the goals of this part of the exam, then with its structure, followed by the assessment criteria in terms of which your effort will be scored. In explaining how the answers are marked, we will give examples of actual answers that passed and failed, plus the examiners’ comments. Lastly, we will give you our own DELEhelp Acing Tips for this part of the exam. These are taken from our in-house workbook #9.2 “DELE / SIELE EXAM ORIENTATION AND ACING TIPS. In its 96 pages you will find guidance and practical tips regarding all the sections of the DELE / SIELE exam (i.e., reading and listening comprehension, plus written and oral expression). It is available as an e-book for free download, for readers of this blog. You can request it with the convenient contact form at the bottom of this page – there’s absolutely no obligation attached. 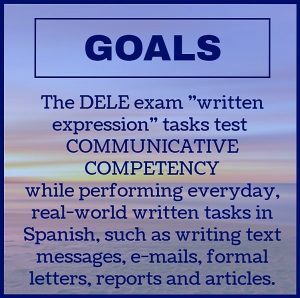 The overall goal of the DELE exam is to certify a candidate’s level of competency at actually communicating in Spanish, in simulations of typical real-world communicative settings. It is not a school or college type exam – it is NOT primarily concerned with abstract knowledge of Spanish. It tests the ability to apply knowledge, in conversation and in using the written word. For conversation proficiency, it tests listening comprehension and oral expression. For the written language, it assesses proficiency at reading comprehension and at expressing yourself in writing – setting every-day tasks such as writing e-mails, letters, reports and articles. As a consequence, in the course of the written expression exam the candidate will not be unduly penalized for small errors of spelling or grammar, as long as these aren’t repetitive or of such a nature that it impedes clear transmission of the meaning of the intended message. In brief, what the DELE tests is your proficiency at understanding meaning, and conveying meaning in Spanish. Duration: 60 minutes. Number of tasks: 2. Total extent of the texts: between 230 and 270 words. Format of the answer: The candidate must write by hand his/her answers to the tasks that have been set, doing so in the space reserved in the exam book itself. Scoring: Answers are assessed according to two scales – holistic and analytical. The holistic scale counts for 40% of the final score and the analytical scale for 60%. For the analytical scale, the two task papers count equally. 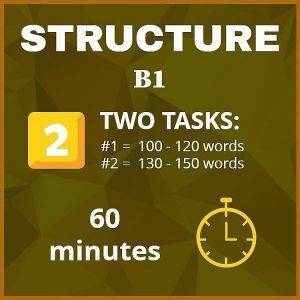 For the sake of comparing B1 with other levels, here’s the structure for the written expression tasks of levels A1 and C2 respectively: A1 = 25 minutes total duration, completing a biographical form and writing a brief message of 20 – 30 words; C2 = 150 minutes total, 3 tasks of 1,000 words, 450 words and 250 words respectively. 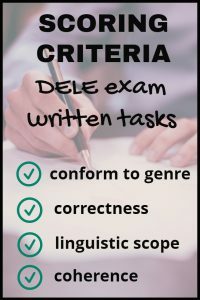 The following descriptions of the structure and scoring criteria for the DELE B1 written expression tasks, have been directly translated from the official curricular documentation (which for most students would be difficult to follow in its original Spanish, written by academics for academics). For the sake of authenticity and completeness of this very important information, we have not abbreviated and have kept to the original format of the curricular documents (which explains why the following sections will not be in typical blogpost language!). Task 1 – Format: The task consists of writing a letter or a marketing message, an e-mail or a blog, which may include descriptive text or narration. Extent of the writing: Between 100 and 120 words. Focus: In this task the capacity of the candidate is evaluated to produce a simple informative and cohesive text. Based on: The writing task is based on a text provided in the exam paper (a note, announcement, letter, e-mail etc.) to which the candidate’s writing is a sequel. May be personal or public in nature. Task 2 – Format: The task consists of writing an essay, a diary entry, biography etc., which may include description or narration. Two options are offered, of which one must be chosen. Extent: between 130 and 150 words. Focus: This task tests the capacity of the candidate to write a descriptive or narrative text in which opinion is expressed and which conveys information of personal interest, based on personal experiences, sentiments, anecdotes etc. Based on: A text provided in the exam paper, which may be a brief newspaper announcement, blog or social media, which helps to define and contextualize the candidate’s required output text. May be of a personal or a public nature. For scoring the written expression tasks, an analytical scale with four categories, plus a holistic scale are used. Both the holistic and the analytical scale consist of four ordinal scoring bands, ranging in value from 0 to 3 points. Values of 2 or 3 signify a pass, while 0 and 1 result in a fail. Value 3: Writes texts that are clear and precise, amplifying them with details of both a concrete and an abstract nature. Writes letters, messages and notes in the correct register for the particular context (i.e., tone: levity / seriousness; formal / informal). Efficiently develops all of the points indicated in the orientation text in the exam paper. Value 2: Writes simple texts that are clear. In the case of the letters, messages and notes, respects the basics conventions of the genre (introduction and conclusion) and uses basic courtesy formulas (greeting, end salutation). Develops with clarity the great majority of the issues provided as orientation in the exam paper, even though some may have been skipped or not dealt with adequately. Value 1: Writes texts that are very short and basic, dealing with immediate environment or aspects of daily life. In some cases, the information appears disorganized or incomplete, which obliges the reader to re-read in order to understand. Writes letters, messages and notes that are simple and brief, related to basic necessities or transmitting personal information. Hesitantly uses the most common functional exponents, elementary courtesy rules or formulas of greeting and treatment («muchas gracias»; «hola, ¿cómo estás?») or misses some important details (for example, the greeting and farewell salutations in a letter). Mentions only some of the issues stipulated in the exam paper, or doesn’t develop these sufficiently. Value 0: The text produced is limited to a series of simple, isolated phrases about self or other persons or themes from own closest personal environment. In some cases, the text produced is incomprehensible. Makes errors in simple everyday formulas related to greetings, farewells, presentations and expressions such as: «por favor», «gracias», «lo siento». There are errors in the tonal register and important details are omitted. The text produced doesn’t follow the guidelines provided in the exam paper and doesn’t meet the required extent of writing by having fewer words. Value 3: Writes clear, coherent and structured texts with limited but adequate use of cohesion mechanisms to link The message is planned, taking into account the effect it can have on the receiver. It synthesizes, evaluates and varies the information from other sources trying out new combinations and expressions, marking the relationship between ideas. Properly uses punctuation, but may make some mistakes. Value 2: Writes brief and cohesive texts, ordered by a linear sequence of simple elements, using information organizers («primero», «luego», «después») and common basic connectors («y», «también», «por eso», «entonces», «pero», «porque…»), although the text displays some deficiencies or limitations in its structure. Value 1: Writes a series of short sentences linked with very simple and basic connectors («y», «pero», «porque»). The discourse – in some cases memorized, messy or incomplete – obliges a rereading in order to understand it. Value 0: The text is limited to a series of words or groups of words linked with very basic and linear connectors («y», «pero»). The discourse does not maintain an organized structure that allows one to follow the reasoning of the candidate. Value 3: Maintains good grammatical control in everyday situations, even though may still make some unsystematic errors or show minor flaws in sentence structure, that do not produce Spelling is reasonably accurate but may make some mistakes under the influence of the mother tongue in the least common lexicon. Value 2: Shows reasonable control of basic linguistic elements and common structures used to meet immediate and predictable personal interest or May make some mistakes in the spelling of words, but that does not interfere with the transmission of the main idea of the text. Value 0: Shows limited control even of very basic and simple grammatical structures, or uses short (probably memorized) phrases related to basic and immediate needs. Makes abundant grammatical and spelling errors (concordances, errors in the choice of the person of the verb), which hinder the understanding of the message and require continuous rereading. Value 3: Dominates a large vocabulary, which includes some idiomatic expressions and colloquialisms, which allows the description of unpredictable situations, as well as explaining the main points of an idea or problem with reasonable precision and express thoughts on abstract and cultural topics. May commit some minor lexical imprecisions. Value 1: Has a limited vocabulary which is used to convey basic information in situations related to very specific daily needs; otherwise, vocabulary is insufficient to convey the message. Makes mistakes that do not affect the communication. Value 0: Uses a very basic repertoire of isolated words and phrases that are not sufficient to transmit the required information or for communication to Commits constant lexical inaccuracies, and interference from other languages is evident. Value 3: Adds a level of detail to the information required, which ensures that the organization and formulation of the message amply meets with the stated communication objectives of the level. Uses a linguistic repertoire sufficient to present clear and precise descriptions, express opinions and viewpoints and develop arguments, without apparent limitations. The result is a clear and detailed text. Value 2: Provides the required information in an understandable way and manages to convey Expresses self clearly in exchanges of information related to everyday themes, though, if the issues are abstract topics, some hesitation may occur or may be missing some detail. Uses a linguistic repertoire ample enough to express self adequately on everyday situations and topics of interest to the candidate. Despite some mistakes, hesitations or repetitions the candidate constructs simple, linear sentences with keywords in an understandable and clear manner. Value 1: Provides part of the required information with However, due to brevity and lack of clarity the discourse is insufficient to convey the message. Uses a limited linguistic repertoire composed of syntactic structures and memorized expressions in phraseology filled with elementary errors that makes it difficult to understand the candidate and, in some cases, leaves unclear the general idea. Value 0: Contributes only some data which is insufficient to convey the message. The written text consists merely of a series of very short and simple sentences in a disorganized discourse with an abundance of errors that hinder the understanding of the message. ¡Hola Diego! Soy muy feliz para el tuyo correo. Espero que tu estes bien. Fui en Madrid solo dos dia antes que ir a Salamanca con el bus. Estabo en un bar cuando he vido Miguel con su hermana. Despues un café con ambos yo y Miguel decidimos que hacer un giro de la ciudad porque yo nunca la había vida bien. Me conouci en sitios realmente maravigliosos y me gusto muchissimo la suya compañía. Despues fuimos en un jardín para descansar: fu un dia maraviglioso. Espero que venir pronto a Barcelona, a lo meyor el próximo mese. Tengo mucha gana de verte. Hasta pronto. Hola me llamo Sara y quiero contar mi experiencia porque creo que esta iniziadiva es muy interesante. Para mi comer significa comer untos a la gente que quiero. y condivider nuestras experiencias del dia. Hace tres años había una comida que me acuerdo bien. Era un ordenario dia de Enero. Y estaba con mi madre, mi padre y mi hermana como quasi todos los días; porque en mi familia es normal comer untos. Ese dia comimos una comida preparida por mi madre, que es una bravissima cocinera. Se trataba de una pasta tipica del mi pais . «pasta a la nona» también pollo con patatas. Y al fin una tarta muy rica. Ese momentos lo acuordo con mucho gusto porque estábamos untos y feliz A lo mejor una de las ultimas veces. Aptness for genre: The texts in task 1 and task 2 are brief and basic. The task guidelines that were given, were not sufficiently developed by the candidate, with the discourse being limited to his/her everyday environment or aspects of private life. In some cases, the information appears haphazard and incomplete (tarea 1: «Fui en Madrid solo dos *dia antes que ir a Salamanca con el bus. Soy muy feliz para el tuyo correo»; tarea 2: «A lo mejor una de las ultimas veces»). Hesitantly uses somewhat incomplete greeting formulas (tarea 1: «Soy muy feliz para el tuyo correo»). These shortcomings are reflected especially in task 1 and results in the candidate not being able to achieve a value 2 grade in both tasks taken together. Coherence: Although makes good use of organizational structures (tarea 1: «Despues fuimos…»; tarea 2: «Y al fin…»; «Porque en mi familia…». «Me llamo Sara y quiero contar…»), as well as some connectors and cohesion mechanisms, the texts produced have a limited number of connectors that are insufficient to achieve the degree of coherence required for this level. These shortcomings are reflected in both tasks, and causes this sample as a whole to qualify only as value band 1. Correctness: Use simple grammatical structures and makes basic mistakes (tarea 1: «Soy muy feliz para el tuyo correo…»; Fui en Madrid solo dos dia antes que…»; «Despues un café con ambos yo y Miguel decidimos que hacer…»; «Me conoucí…»; «fuimos en…»; «Espero que venir…»; «Tengo mucha gana de verte». Tarea 2: «Hace tres anos había una comida…»; «… una pasta típica del mi país…»; «Ese momentos lo acuordo…»). There are frequent errors in verbal morphology (tarea 1: «he vido, conouci, verte», tarea 2: «condivider; preparida»). Commits systematic errors of spelling and punctuation (tarea 1: «… para descansar: fu un día maravilloso», «muchissimo»; tarea 2: «anos»; «… a la gente que quiero. Y condivider…»; «Los días; porqué…»). Scope: Has a limited vocabulary, with a clear influence of the mother tongue; this vocabulary is insufficient to convey the message. tarea 1: «vido, giro, vida (for vista), maravigliosos, mese»; tarea 2: «iniziadiva; untos; condivider; ordenario; quasi; bravissima; rica; acuordo». Holistic Scale: Although the texts produced contain information that can be understood, in the two tasks the candidate uses a limited linguistic repertoire composed of syntactic structures and memorized expressions in a written discourse full of elementary errors that hinder comprehension. All this results in the two tasks to be assessed as achieving value band 1. En mi comentario quería escoger como tema un tiempo que todos nosotros conocemos muy bien: navidad. Cada vez que se acerque el fin del año nos preparamos a comer bien y por supuesto comer mucho. Recuerdo especialmente la cena del 25 de diciembre en el año en que cumplí los 16 años. Como cada año, toda la familia se reunía para celebrar la cena tradicional. Lo especial era que pude por la primera vez sentarme a la mesa de los adultos. Recuerdo bien como empezé con el primer plato que era salmón. Por la primera vez en mi vida venía acompañado de una copa de champán servido po mi abuelo en persona. Me sentí muy grande y por esto lo recuerdo tan bien. Después seguí con fruta rellenada de castanias preparado con mucho talento por mi abuela. Y por supuesto terminé con helado como postre. ¡Qué rico! Aptness for the genre: The texts are clear and to the point, and in the case of Task #1 respects the conventions of the genre (Intro: «¡Hola Diego! Gracias por tu mensaje»; closure: «Hasta pronto, saludos»). Develops with clarity the great majority of the points provided in the orientation text, even though in Task #1 fails to develop the reasons for the trip to Madrid. Coherence: Writes brief and cohesive texts, structured along a sequential line of basic elements, utilizing information organizing mechanisms and basic link phrases of high frequency (task 1: «Cuando me encontré…»; «Pero como Miguel y yo…»; «Al final olvidé el tiempo y tuve…»; «Era caro pero valía la pena…»; task 2: «En mi comentario…»; «… y por supuesto…»; «Como cada año…»; «Por la primera vez…»; «… y por esto…»; «Después…»). Th structure of the text and the distribution of the paragraphs are well ordered, thanks to proper use of punctuation. Is an effort that qualifies as band 2. Correctness: Demonstrates a reasonable control of the basic linguistic elements and habitual structures. May commit some errors (task 2: «Cada vez que se acerque…»; «Lo especial era…»; «Por la primera vez…») but this does not interfere with the transmission of the message. The spelling is correct. Linguistic Scope: Possesses a sufficient vocabulary to participate in daily exchanges related to his/her immediate environment. May commit errors when using constructs or vocabulary that’s more complex (task 1: «mandarle la bienvenida»; task 2: «rellenada»; «castanias»). There aren’t important errors that impede comprehension and in totality meets the criteria for a score of band 2. Holistic Scale: Conveys the required information in comprehensible form and succeeds in transmitting the message in a manner that’s clear, detailed and without vacillations. The result are texts that are comprehensible and well-structured in both tasks, qualifying for scoring as band 2. Do as many mock exams as you can, to familiarize yourself with the format and the time constraints – but do get expert feed-back, otherwise you may be leading yourself up the proverbial garden path. When preparing for the written exam, practice your handwriting, especially if it has been some time since you’ve last had to write with a pen in this computer age. Make sure that you are writing legibly, and get your fingers properly “fit” again. Also check how many words you typically write on the lined DELE exam sheet; during the exam it is a waste of time if you have to sit and count – rather know beforehand how much of the page would constitute a given number of words in your handwriting. Read the instructions, and plan: Once you have the exam paper in hand, make absolutely sure that you understand what is required of you. Highlight or underline key points in the instructions, and transpose these to a sketched scheme of structure, so that you can make sure that you cover every element required of you in your presentation. When you plan your written presentation, keep in mind the main categories of the analytical scoring scale: aptness to genre, coherence/fluency, correctness and linguistic scope. Aptness requires you to adopt a structure and style of writing suited to the genre of the task at hand (for instance, a letter of complaint will have a very different structure and style to a text message or an essay) as well as selecting the appropriate register of tone/vocabulary (i.e., formal or informal). Structuring your presentation is fundamental to success, especially regarding coherence and aptness to genre. A letter, for instance, will need to consist of three components, usually presented as separate paragraphs: firstly, defining the purpose of the letter; secondly, substantiating what you are saying; and thirdly, what kind of answer you expect. It goes without saying that you have to start the letter with the appropriate greeting and end it with the correct form of taking leave (the common Spanish versions of these you have to learn and remember, taking note also that Spanish formal letters tend to be more replete with courtesies than typical English usage). Examples of a formal greeting would be “Estimado / Respetable Señor” with the name of the person, if known, followed by a heading such as “Asunto: Trafico en la calle del Augua, Aldea Santa Ana”. A formal letter to anyone who isn’t a close friend or family member will usually start with a courtesy first phrase of the kind: “Espero que todo vaya bien en sus labores diárias.” and then: “El motivo de mi carta es…” The typical end salutation in Latin America for this type of formal letter is: “Atentamente”. Journalistic style: If you are required to write a journalistic article, you need to include the well-known “what, where, when, who and why”. Short sentences: Whatever the typical structure of the genre you are required to write in, you will have to present your thoughts in logically structured paragraphs, trying to keep to one issue per paragraph. Try and avoid long sentences – in any form of writing, short sentences usually are stylistically better. In the exam context in particular, the longer the sentence, the greater the possibility for confusion and grammatical errors, such as regarding tenses or agreement of gender and number. With clarity being an important scoring requirement, keep your sentences short and to the point. Link phrases: The foregoing does not imply that you should spit out short, unconnected sentences or paragraphs, staccato-style. You will have seen in the scoring criteria that coherence and fluency are very important; the examiners are actively looking for the use of appropriate connectors or linking phrases. As you sit down, make a quick list of such expressions at the top of your exam page as a memory jogger, and incorporate them appropriately as you write your texts. Some examples: sin embargo, así que, de todos modos, a pesar de que, no obstante. Stay calm and think laterally: If you run into problems with words you would like to use, but which are stubbornly stuck on the tip of your tongue, think laterally and improvise (don’t waste time by getting hung up on a particular word, and don’t panic). Pay attention to the minimum length required for each task – you will lose marks if you don’t write at least that much. However, don’t fill up lines by repeating ideas that you’ve already stated, the second time just in different words. Do not copy entire sentences from the exam question either. Do not regurgitate memorized model answers; examiners are trained to recognize them and your test will be invalid. Proofreading: There isn’t time during the exam to entirely re-write first drafts. You have to write down your answer straight away (after having first carefully analysed the instructions, and then equally carefully having planned and structured your text). Then use the remaining time to proof-read your work. To this end, it is a good idea not to write too densely on the page (i.e., you should initially write your words somewhat spaced, in order to allow you to fit in corrections). The DELE is not an exam in the aesthetics of handwriting, so don’t worry if you need to scratch out and correct – as long as it remains clearly legible. Proofread particularly for agreement of gender and number, for correct use of ser/estar and por/para, for obligatory use of the subjunctive mood, and for spelling mistakes, paying attention to accents (tildes). Check your watch: It is imperative to have an old-style watch at hand, to check your timing. Keep in mind that you won’t be able to use your smartphone for this, since their presence in the exam center is prohibited, for obvious reasons. It therefore needs to be a traditional timepiece. Be aware also of the relative weights of the different written tasks, so that you don’t waste too much time on initial, low-weight tasks. 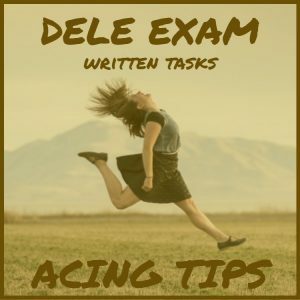 For example, in the three tasks of the DELE A2 written expression exam, task 1 counts for only 17% of the total score, task 2 for 33% and task 3 for 50%. 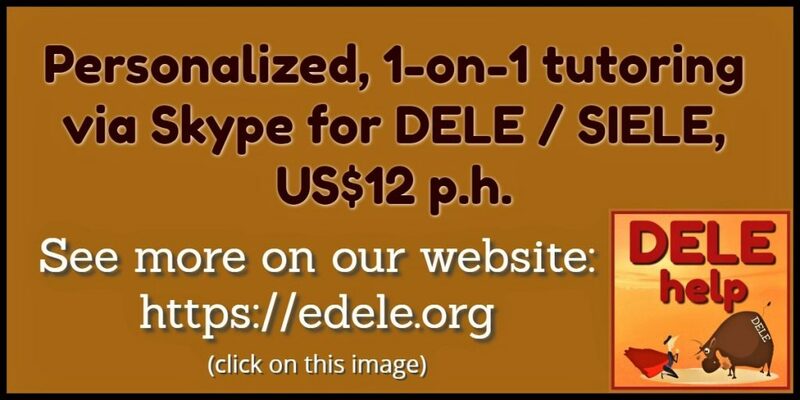 For more information, feel free to request our e-Workbook #9.2 entitled DELE / SIELE Exam Orientation and Acing Tips (96 pages). It is available for download, gratis and without any obligation – just ask, using the convenient contact information form on this page. 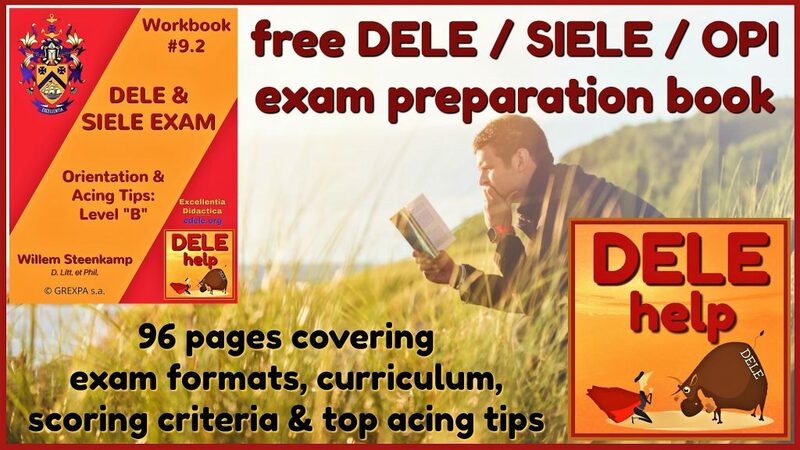 This unique free exam preparation book covers all aspects relating to the goals, format and curriculum of the DELE / SIELE system, plus battle-tested tips for preparing yourself to ace the DELE or SIELE exam. Just click on the image, to ask for it. (You can also ask for our Workbook #8, which covers the OPI / WPT, and which we will also be happy to make available to you FREE). You may also want to check out our personalized, one-on-one online tutorial assistance via Skype – the first exploratory conversation of one hour is also free and without obligation (Click on the display ad below, to be taken to our web-site). Our rate is only US$10 per hour, which includes our own prep and homework / mock exam review time, plus our free in-house workbooks – there are no hidden extra costs. 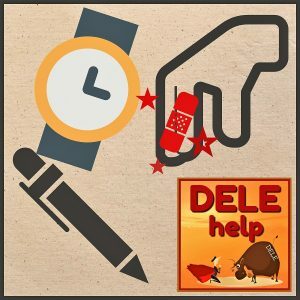 Watch 2 minute video introducing DELEhelp’s services. Thank you for reading this blog-post. Please see also our earlier posts, covering other important aspects of the DELE exam. Any and all comments will be highly appreciated. Thank you for this! I have been worrying about the lack of complexity of my Spanish. I’ve printed of this page, and will read it in detail – wish me luck for May! Buena suerte, Kim. I’m sending you a link to our free 96-page in-house Workbook #9.2, “DELE Exam Orientation and Acing Tips”, to your e-mail. Thank you for this article, it is fantastic! I think preparation is definitely key, I have also found that Italki is a good way to find teachers who can help you with preparing for your exam. Please can I have a copy of the dele guide that you have mention in the article? Hi, may i request for this: free 96-page in-house Workbook #9.2, “DELE Exam Orientation and Acing Tips” for DELE A2. Please send to my email. Thank you very much.